Seeking enhanced partnership with Guyana through exchange of ideas and best practices in environment conservation, increasing the carbon sink and achieving sustainable development, Union Minister for Environment, Forest and Climate Change, Science & Technology and Earth Sciences, Dr. Harsh Vardhan, called on the visiting President of Guyana, Mr. David A. Granger, in New Delhi today. Climate Change was among the various issues discussed between the two leaders. 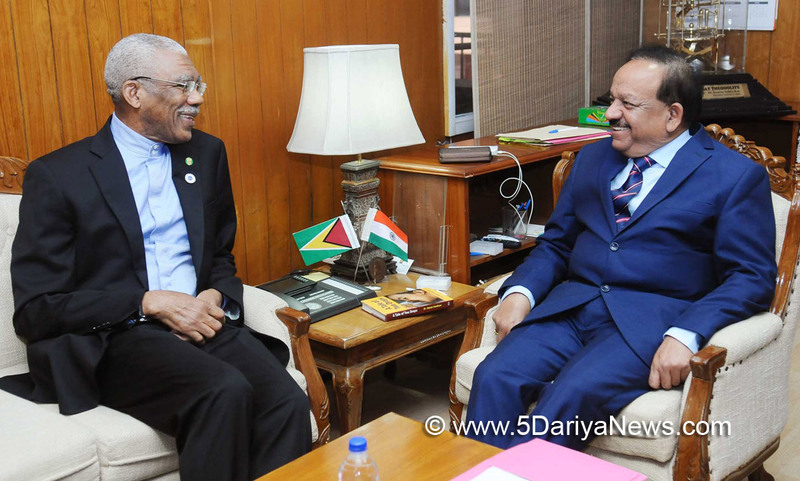 Discussing the impact of Climate Change on the country’s natural resources, Dr. Harsh Vardhanapprised the President of Guyana that India is taking into account the concerns related to Climate Change in formulating its developmental policies. Dr. Harsh Vardhanalso sought Guyana’s support for India’s stand on Climate Change in United Nations Framework Convention on Climate Change (UNFCCC). He also conveyed India’s appreciation for the signing of Paris accord by Guyana.